Easy at home exercises with videos and illustrations. Illustrations and videos. No equipment needed. Try this 15-20 minute routine of easy at home exercises for a convenient way to build your strength without equipment. The exercises below include straight forward instructions, illustrations and 6 short videos that show how to progress the exercises once your strength and fitness improves. Lie on your back with your knees bent and your feet flat on the floor. Raise your legs, one at a time, so that your knees are directly above your hips and your lower legs are parallel with the floor. Hold this position 10-15 seconds. Next, return to the starting position, lowering 1 leg at a time. Keep your abdominals firm so that your back is completely still throughout the exercise. Repeat 3-4 times. The video shows the Tabletop on a foam roller, a more challenging version of the exercise. Lie on your back with your knees bent and feet flat on the floor as shown in the illustration below. Raise your bottom upward slowly. Imagine lifting one vertebra at a time from your exercise mat. Continue lifting your bottom upward until there is a straight line from your shoulders to your knees. Hold this position 10-15 seconds. Think of reaching your knees forward over your ankles as you hold the bridge. Repeat 3-4 times. The video below also shows the single leg bridge. For this exercise, perform a bridge. Then at the top of the bridge, straighten 1 leg. Switch legs after a 5 second hold. Lower to the start position and repeat 4-6 times. Lie on your stomach and rest on your forearms with your elbows directly under your shoulders. Press through your shoulder blades until they are spaced wide on your back (instead of being pinched together). Next, tighten your abdominals to lift your waist off the floor. Form a straight line through your neck and upper body to your knees. Hold this position 10-15 seconds, then lower your waist to the floor. Repeat 3-4 times. To increase the challenge, try this exercise on your toes instead of your knees. See the video below. 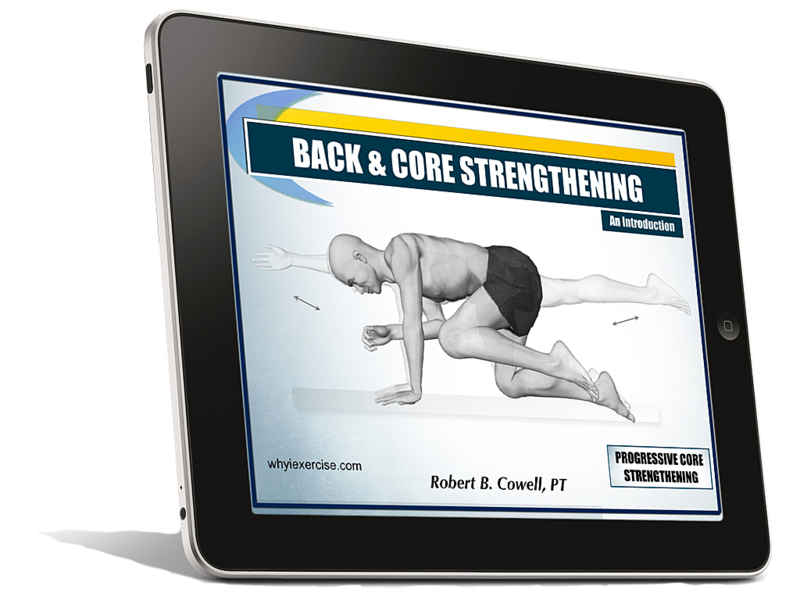 *To get more training with this forearm plank exercise and related coremovements, download my free eBook, Intro to Core strengthening. 1) Balance on your L hand and L knee (knee bent 90 degrees), reach your R arm straight out from your body. Straighten your L leg so that it’s in line with the rest of your body. 2) Raise your R Leg as high as you can, then slowly lower to the start position. As you may be noticing, easy at home exercises doesn't mean you get an easy workout! For best results, use a moderate level of effort during this routine and increase your effort as you become more familiar with the exercises. Go up on your toes as high as possible without leaning your body weight forward. Stay up and maintain your balance for 2-3 seconds. Repeat up to 25 times. Keep your weight over your big toes as you go up and down. Once you can easily do 25 repetitions, try lowering back down on one foot. Then progress to single leg heel raises. Almost there! 2 more moves to go and you'll finish this routine of easy at home exercises. With your arms out to the side and elbows straight, slowly roll your arms forward, down, back and up as shown. 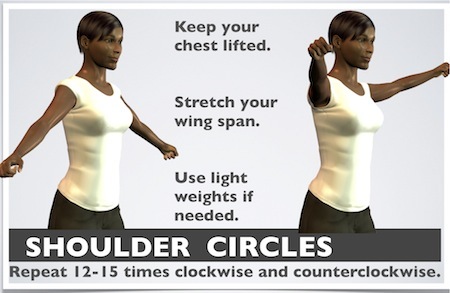 Stand tall with your chest out and keep your arms long to maintain good posture. Repeat 12-15 times and then reverse directions. Note: with slow movement and light weights in your hands, this can become one of the more challenging rotator cuff exercises. Start with 1/2 to 1# weights at first. Stand with your back against a wall and step your feet out from the wall about 18”. Then lower yourself down into a squat. As with the lunge, stop at the point where you can feel your muscles working. Keep both of your feet pointing forward and keep your knees centered over your ankles. Hold for 15-20 seconds and repeat 3-5 times. You can squeeze a volleyball or playground ball between your knees during the exercise to isolate the inner quad muscles. This exercise can also be done with a stability ball. Lean against the ball so that your waist is against the center of the ball. Of course, the deeper you go, the more challenging the exercise. Just don't go past a 90 degree angle so that you avoid excessive stress on your knee. Note: This routine of easy at home exercises was taken from 3 articles that also appear on whyiexercise.com. For more exercises similar to these, see the articles on back strengthening exercises, knee strengthening exercises, and body weight exercises. Return from easy at home exercises to free home exercise programs.